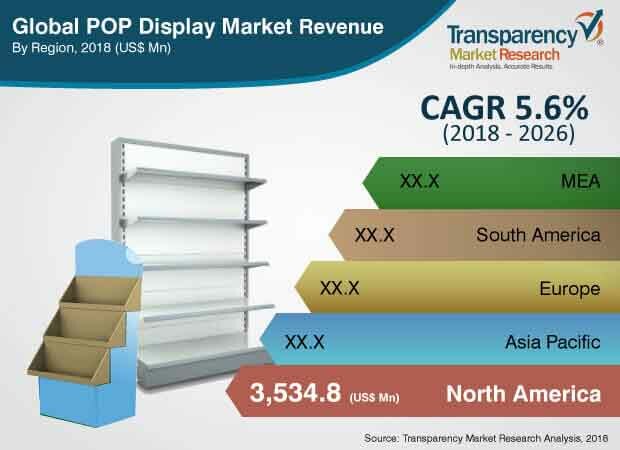 According to a new market research report titled ‘POP Display Market- Global Industry Analysis, Size, Share, Growth, Trends, and Forecast, 2018 – 2026’ published by Transparency Market Research , the global POP display market is expected to reach US$ 16,963.4 Mn by 2026, expanding at a CAGR of 5.6% from 2018 to 2026. According to the report, the global market is expected to be influenced by a range of macroeconomic and industry-specific factors. North America is likely to continue to be at the forefront of global demand, with the market in the region expanding at a CAGR of about 5.3% in the coming years.The evolution in the retail trade sector is anticipated to significantly drive the POP display market. Theglobal POP display marketis projected to expand at a significant growthrate due to the increasing trend ofproduct branding with the adoption of POP displays. POP displays play an important role in the branding and promotion of products. POP displays attract the customers at the point of purchase or point of sale.Market players are continuously enhancing their research and development expertise to design creative and portable POP displays. Also, the increasing demand from retailers to sell and display their merchandise items is expected to augment the POP display market. The global POP display market has been broadly segmented based on product type, material type, sales channel, application, and region. In terms of product type, the market is segmented into counter display, floor display, gravity feed, pallet display, side kick display, dump bin display, clip strip, and other POP display. Based on material type, the market is classified into corrugated board, foam board, plastic sheet, glass, and metal. On the basis of sales channel, the market is segmented into hypermarket & supermarket, departmental store, specialty store, convenience store, and others. In terms of application, the market is classified into food & beverages, cosmetics & personal care, pharmaceuticals, printing & stationary, electronics, automotive, and others. In terms of region, the global POP display market is segmented into North America, Europe, Asia Pacific, Middle East & Africa, and South America. According to the research study, the floor display product segment held a significant share of the POP display market. The segment is anticipated to expand at a CAGR of 6.3% during the forecast period and is anticipated to remain dominant over the forecast period.The counter display segment is expected to expand at a CAGR of about 5.7% over the forecast period. Gravity feed display, clip strip, and other POP display segments are expected to expand at a decent growth rate. Based on material type, the corrugated board segment of the POP display market held a prominent share of about 61.7% in 2017, followed by the metal segment. In terms of sales channel, the hypermarket & supermarket segment is expected to hold a prominent market share of about 45.1% in 2026. This is due to the larger availability of space in hypermarkets and supermarkets. Based on application, the food and beverage segment accounted for significant market share in 2017. This is due to the fact that food and beverages being consumables are placed at POP displays for fast sale of the products. Food & beverage segment is anticipated to continue to dominate the market during the forecast period. The pharmaceuticals, automotive, and printing & stationary segments are anticipated to expand at a decent CAGR, contributing toward the growth of the global POP display market. North America held the largest market revenue share of the global POP display market in 2017 and the market in the region is anticipated to expandat a CAGR of 5.3% during the forecast period. The need for creative and attractive POP displays is expected to drive the POP display market across North America. In the Asia Pacific POP display market, China held majority of revenue share followed by Indiain 2017. Also, in terms of revenue generation, the market in India in anticipated to expand at a healthy CAGR over the forecast period due to the growing retail sector. Increasing promotion and branding of products is likely to create a lucrative market for POP displays. The research study includes profiles of leading companies operating in the global POP displaymarket. Market players have been profiled in terms of attributes such as company overview, financial overview, business strategies, and recent developments. Some of the key players in thePOP displaymarket are International Paper Company, DS Smith Plc, Smurfit Kappa Group PLC, Sonoco Products Company, Menasha Packaging Company, LLC., Georgia-Pacific LLC, WestRock Company, Pratt Industries Inc., Marketing Alliance Group, and FFR Merchandising Company.